Western Australia: 1864-79 2d yellow, unused. 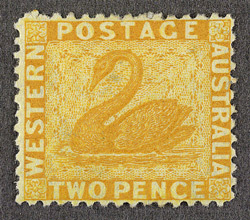 bl.uk > Online Gallery Home	> Online exhibitions	> Philatelic rarities	> Western Australia: 1864-79 2d yellow, unused. In the 1864-79 series of postage stamps for Western Australia printed in London by Thomas De La Rue the 2d value was coloured yellow. In error some were printed in mauve (the colour of the 6d value) and issued in 1879. The printers had not realised the mistake and the stamps were printed and sold as 6d values. This makes them technically speaking an error of value rather than of colour. Shown is the normal 2d. yellow.